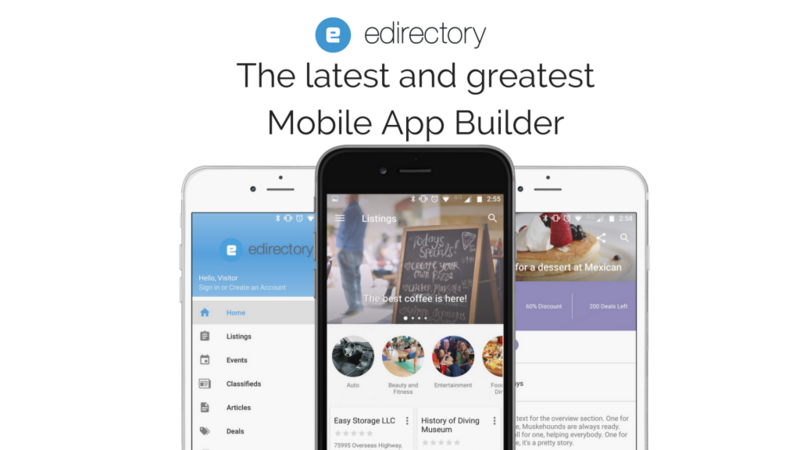 eDirectory.com is thrilled to release the latest version of the directory app builder. With a completely revamped design, powerful features, and a sleek interface – this new app release will add tremendous value to your online directory enterprise. Engage your app users with TRUE push notifications. eDirectory mobile app builder will now integrate with Google Firebase to offer an easy way to create, schedule and manage the use of push notifications. Send messages to all subscribers or segment your tailored messages to specific users to drive activity and retention. Increase your revenue potential by offering paid push notifications to your members for maximum exposure. New features include a beautifully-redesigned homescreen will now serve as the main app welcome screen. Publishers will be able to manage the module listings display and add some flare with slider images, optional summaries, and special links. These sliders create a great new opportunity to offer your members premium exposure on the homescreen for value-adding opportunities. Another great new feature is the expanded color palette designed to better match your branding. Each module may also be color coded which will easily distinguish which section of the app you are using including listings, deals, events, articles or blog creating a more intuitive app navigation. Create some distinction among your features with brand-building color schemes. eDirectory has integrated with Google Firebase – a super-charged mobile platform which expands the usage and functionality. With Google Firebase Analytics – app publishers will now have the ability view app-specific analytics and to drill down on app usage for detailed behavioral reporting. Demographic segmentation, including age, gender, and location are available right out-of-the-box. With this powerful new integration, the foundation has also been set for continual optimization and new feature releases. New expanded search capabilities include additional filters, search history as well as auto suggest. Search-by-voice is an awesome new feature which makes it incredibly easy and convenient for mobile users to search simply by speaking their request. All search functionality is now supported by Elasticsearch – a powerful program also used in eDirectory’s web based platform searches. We’ve also added a ‘log in with Google’ feature which will make it so easy for Google users to sign in using their Google account credentials. We are proud to announce all the hard work we’ve done to bring our valued customers the latest and greatest so they can continue to grow their online revenue goals! We look forward to seeing what you build with the newest version of the eDirectory.com directory App Builder. If you’re an existing eDirectory client, and would like to take advantage of what’s new, please contact your account executive for next steps or complete the Upgrade Request form found here. For clients running the latest version, the new App Builder is LIVE. Simply build, publish and submit to iOS and Android. We also can help submit. If you’d like to learn more about launching your online Enterprise with eDirectory.com, simply click now “Try Free Demo” or call 1-800-630-4694 and your assigned account executive will be more than happy to make sure we’re a good fit for your project.